The App Store’s cluttered corner reserved for note-taking applications recently got an app by Moleskine, a company known for their brand of physical journals. 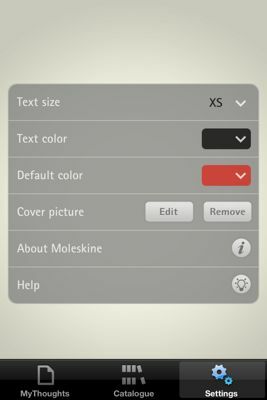 Moleskine for iOS allows you to choose between different virtual paper types (ruled, grid and blank blank), font sizes and colors for text. It also comes with Email, Facebook and Twitter sharing, among other standard features that most note-taking apps now have. 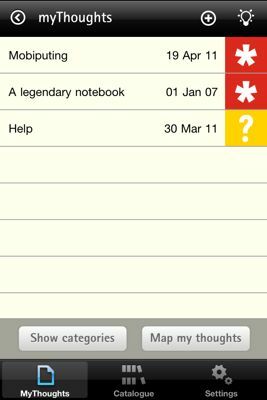 A unique feature is Moleskine’s “Map My Thoughts” function, which allows you to geotag a specific journal entry. This provides a way to go back into your journal and track all of your entries by location. The app also has a Sketching tool, which can add an artistic touch to your notes and projects. Surprisingly, the app lacks landscape writing functionality. Moleskine’s mobile app is quite different than its physical product line of journals. The latter focuses on a ‘something for everybody’ approach, while the mobile application is essentially a hate it or love it affair. There are hundreds of full-featured journaling apps in the App Store, and personal preference will play a huge role in whichever feels most comfortable. 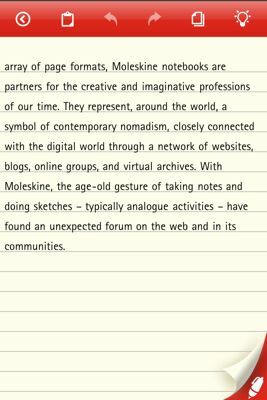 For example, Moleskine lacks some important features that other ‘full featured’ note clients have. These include a companion desktop application for syncing, Dropbox support, and scrollable text. If your journal entry is longer than a page, it takes two taps to go between pages in the same document. What this app lacks in features, it makes up for in design. The app’s color scheme and interface style are very well done, and pages flip smoothly and resemble the page flipping of a real physical journal (almost). However, if you’re looking for a more mature, feature-centric app to cover your mobile note-taking needs, you may want to look elsewhere in the App Store’s productivity section. You can download Moleskine for iPhone, iPod Touch and iPad in the App Store for free.